Cyril Barrand was born in Bottesford in 1889, the son of Betsy and William Barrand. Cyril’s father, William, was born in Great Gonerby in 1847 and and his mother, Elizabeth, was born in Londonthorpe, near Grantham in 1859. Betsy and William had seven children, five sons, Ernest (1882), Walter (1884), Cyril (1889), Fred (1882) and Leonard (1884) and two daughters, Edith (1881, who is not mentioned in later censuses and may have died young) and Lily (1887). In the 1891 Census they were living at 8 Rutland Arms Road, Bottesford and William’s occupation was given as a ‘cottager’. Sadly William Barrand, died in 1895. Before his death the family must have prospered. William left an estate of £60.18s. – over £6000 in current money. In 1897, Betsy married her second husband. William Edwards, born in 1845, who, according to the 1891 census, had a tailors and drapery business on Queen Street. He was a widower with four children, of whom the two youngest, Robert and Amy, b.1887 (probably twins), may not have survived childhood. By 1901, William and Betsy Edwards lived at 6 High Street with their son William, born in 1899, daughter Ada (b.1900), stepsons Cyril, Fred and Leonard and stepdaughter Lily. Sadly, Betsy was soon to be widowed a second time. William Edwards Senior died in August, 1901. In 1911 Cyril was employed as a butcher’s assistant and was still living at home on the High Street with his brothers William, Fred and Leonard as well as his mother Betsy and sister Ada. Two other wages in addition to Cyril’s would have been available to contribute to the household. Fred worked as baker’s assistant and Leonard as a gardener’s assistant, helping to support the family with William and Ada still at school. We know from correspondence Cyril whilst serving in France that he was a member of the Bottesford Band. He was 25 and unmarried when war was declared in 1914. Cyril Barrand’s full service record no longer exists and it is not known if he was a member of any pre-war territorial regiment. Many young men from Bottesford were. However, on 26th September the Grantham Journal reported that the Bottesford Band led a parade of all local Territorials who ‘were at home on short leave’ to the Church for a service. As a Bottesford Band member Cyril would have been part of that parade. The only record of his service that still exists is his Medal Index Card. This gives basic information about his unit, service number and medals awarded. Cyril Barrand served as a Private with the 1st Battalion, Leicestershire Regiment. His service number is recorded as 17092 and he was awarded the 14/15 Star. This was only awarded to all those individuals who saw service in France and Flanders from 23rd November 1914 to to the 31st December 1915. He is recorded as entering the ‘theatre of war in France on the 4th May 1915’. His service number is interesting. Another Bottesford soldier who served with the 1st Leicestershires, Harold Brewster, has a similar number, 17091. His Pension Records survive and they show that he joined up in Newark, Nottinghamshire on the 13th February 1915. Consecutive numbers indicate that Harold and Cyril (17092) signed up at the same time and place. Harold was a wagoner and you can imagine them traveling the 7 miles north from Bottesford to Newark on what was a fine crisp Saturday (4C/40F) – perhaps on their day off. 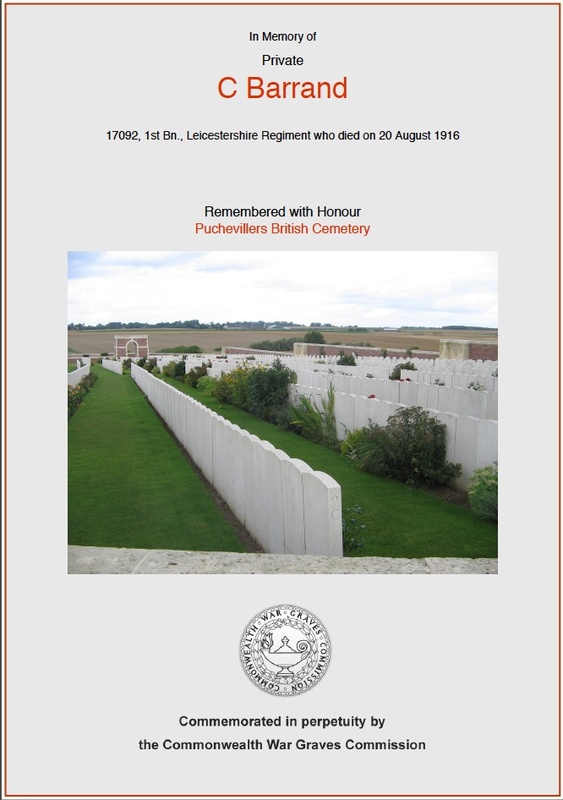 Harold’s record also shows that on the Monday the 15th February he was posted to the Leicestershire Regiment Depot. Doubtless Cyril would have have also been posted to the same place. After 12 weeks of training they were both sent to France in early May as reinforcements to enhance the by then much depleted strength of the 1st Leicestershire Battalion. Their decisions to volunteer would have been made in the light of the realities of warfare not in the febrile atmosphere of September 1914 during the initial rush of men to serve. Whatever Cyril’s motives it would not have been a lightly made decision given the family circumstance of a twice widowed mother with school age children to support. 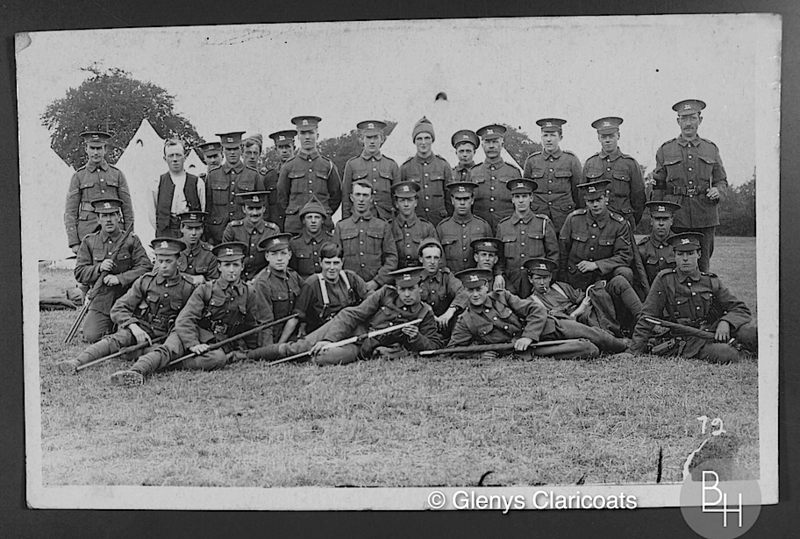 The 1st Leicesterhsire Battalion was a Regular Army Unit of the British Expeditionary Force. It had been continually fighting in the 6th Division throughout the critical days of the autumn of 1914. Cyril would see much front line action. He arrived as the Battalion moved out of divisional reserve near Armentières into the front line. This was to be no easy posting. He would experience the extensive use of gas by the enemy, the first use of flame throwers by the Germans at the Battle of Hooge in July 1915, the bombardment of Ypres ramparts by 17 inch Howitzers on the 14th August 1915. The War Diary vividly describes the sound of ‘enormous shells which made the noise like a railway train as it came and sent sections of bricks 300 feet high at least, and the dust was fearful after each explosion’. Given the rate of losses from his Battalion he must have questioned his chances of survival. He wrote home to William Pacey, the Bottesford Band Master in September 1915 requesting his assistance in securing posting as a musician in the Brigade Band. William Pacey had three son’s in the armed services – Charles, Frank and William. I received the box safely, thanks very much, I found the contents very useful for we was going in the trenches the following night and one of the biggest trouble is the rations, we get plenty of bully beef and biscuits but it doesn’t go down grand. The instruction book is what I wanted, the reason I asked for it was they came round and took names of those who would join the Brigade Band that was being formed, I gave my name in and thought if I had this book I could look things up a bit, but when it came to, our Commanding officer said he could not spare any of his men as we have lost so many lately, so our Batt isn’t represented in the Brigade Band. I was rather dissapointed for they don’t go in the trenches, they play round the officers quarters when we are in billets and play at the hospitals and do a lot of practising so it would have been alllright if I had got in but the book you sent will be allright for we get plenty of time for reading so I can look things up a bit, hoping to join you again if I have the luck to get through allright. Cyril then goes on to write about news that his youngest brother Leonard has been injured, that he had learned about the injury of Frank Pacey, Mr Pacey’s son, and about his expectations concerning the next winter and the conditions in their sector of service in northern France. William Pacey as the Bottesford Band Master produced many fund raising events in aid of the British Red Cross. I heard several of the Bottesford lads have been wounded, I had letter from Len the other day, he said he had been hit in the back, but not very serious, he was in Hospital but expected going back in a few days. Leonard, Cyril’s youngest brother was serving with the 1/5th Leicestershire Battalion. 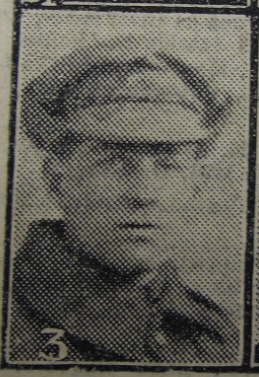 Walter Miller another local soldier recorded in his diary for 2nd September 1915 that three local residents serving with the 5th Battalion were wounded – Billy Christmas, Arthur Geeson and Leonard Barrand (Please see Walter Miller’s WW1 Diary for further details). Sadly, soon after, in October 1915, Leornard Barrand was severely injured and was invalided home. He would never fully recover and died in 1919 age the early age of 25 years. I was very sorry to hear that Frank had been hit but it was a good thing it was no worse. Frank Pacey survived that injury but was fatally wounded in the April of 1916. I’m afraid we are going to have another winter campaign for they are building winter quarters but I don’t think it will be quite as bad as last winter, as we have got trenches in good condition, we are in one of the roughest parts of the line here, this is where they try to break through to Calais, but I think they have found out we are too good for them, if it came to man to man, we should soon have them on the move, we captured about two hundred at Hooge the other week, they looked a rum lot, some quite lads, others looked to be about fifty, its only their guns that hold us back, they are good gunners, but ours are equally good, it was a sight to see them before (as) we bombard their trenches, there was wood, sand bags, men all in the air together a sight nobody would forget that saw it. There was about 200 guns on this one position, so you can guess what a din it was, a right Hell of smoke and fire, there wasn’t many left alive when we went over. We have been promised a rest as we only had two days in billets out of thirty six, so we can do with one. I am posting this with one of our fellows that’s coming on leave, shan’t be sorry when it’s my turn, just to come and have a look round again, hoping it won’t be long. Cyril would survive the the winter of 2015/16 and a further 6 months of trench warfare in the Ypres salient. In early August the Battalion as part of the 6th Division was transferred to the Ancre Heights to fight in the Battle of the Somme. His transfer was not without incident. Their transport train was derailed resulting in a number of injuries. After a few days in camp at MAILLY WOOD they moved into front line positions at Beaumont Hamel overlooking the Ancre Valley. After a very quiet time with few casualties it was decided to test whether the Germans were listening into their telephone conversations. A ‘bogus’ raid was set up and communicated to 9th Norfolk on their left flank and two bombardments were organised. The first produced ‘a very feeble’ retaliation at 4.30 pm. The second at 10.30 pm received ‘an enemy retaliation rather heavier especially with Minenwerfers against A Coy’s front.’ No conclusions are reported as to whether the Germans were indeed listening in. However, the day’s feint attacks resulted in two injuries. Cyril would have been one of those casualties and was severely injured, losing his left leg. He died two days later on the 20th August. Many others from the Battalion would lose their lives during their subsequent ‘for real’ engagement on the Somme.